Microsoft Corp. on Thursday unveiled updates to its Bing search engine - and they seemed to wow the crowds here at the TED Conference in Long Beach, California. First, Blaise Aguera y Arcas, architect of Bing Maps, demonstrated a live-video add-in to to the search engine's mapping feature. He zoomed into 3-dimensional images of streets in Seattle, Washington, and showed off a feature that integrates live video feeds into those images. Microsoft says this might be useful, for instance, if you wanted to see how long a line outside a restaurant was on Valentine's Day. Check out a video demo here. It's pretty impressive. Next, Microsoft's research lab announced a maps app that lets people, virtually, stand on the street and look up at the sky to see constellations. And finally, Microsoft says it's zooming back from page links to give people pages of image results that can be categorized and sorted like index cards. In a demo, a company representative shuffled through TED Conference presenters, organizing their digital cards by field of study, year of their speech and other categories. Check out some of the demos here. Let me know what you think. Is Bing's "decision engine" making headway on Google - which is still the powerhouse in that market? Google also won some fans here with a Nexus One smartphone demo in which a rep spoke into his phone in English and asked the phone to translate his voice into Spanish. Then the phone spoke for him. Great. That's all we need is for a stalker to have easier access to follow someone or when someone leaves and comes back from work leaving their home open to burglary. 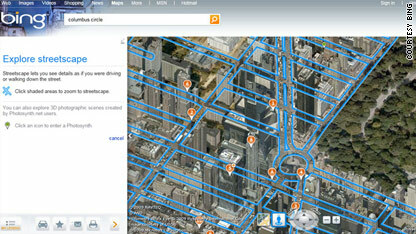 Hey carlos i can see you with my new bing map! Yah you're right Carlos, actually we should just stop making cars altogether because somebody could use it to follow me to my house and kill me. Oh and you can't forget about soda we should scrap that idea, diabetics might get a hold of it and practically poison themselves if they drink it. While we are at it, let's ban roads and bridges - I mean anyone could just drive right up to my house and take all my stuff. Subways, buses, airplanes are out too - it's better to keep people apart, because otherwise bad things always seem to happen. In fact, the final solution should be that we stop people and information from moving all together. You never know. I mean, humans are dim and dangerous by nature, like our friend Carlos here. But we should definitely keep services like Bing maps, that way we can look at each over from safe distances. Thank you Koray and Nathan, people like Carlos just piss me off. Technology will continue to progress and so will the availability of knowledge whether you like it or not. i would have to say that Google is slightly better than Bing search engine,;. well, you can never get wrong wether you use Bing or Google, they are both very good search engines "
Hiya, I am really glad I've found this info. Today bloggers publish only about gossips and web and this is really annoying. A good blog with exciting content, that's what I need. Thanks for keeping this website, I'll be visiting it. Do you do newsletters? Cant find it. Of course on the other hand this kind of would happen, whatrrrs your opinion would happen towards the preceding kinds? The demo video is really impressive! Thanks a lot for sharing it here. I liked the post very much, really.